Part Three in a series on what the new fundamentals of marketing mean to DMOs and destination marketing professionals as inspired by the recent McKinsey article: “The Dawn of Marketing’s New Golden Age”. McKinsey-Speak: Learn to relinquish control of stories as customers interpret and modify them on social media. DMSpeak: Today destination story-telling is not about a special hotel offer or your newest attraction. It’s about activating and enriching an ongoing marketplace conversation with content and perspective rather than trying to control it. 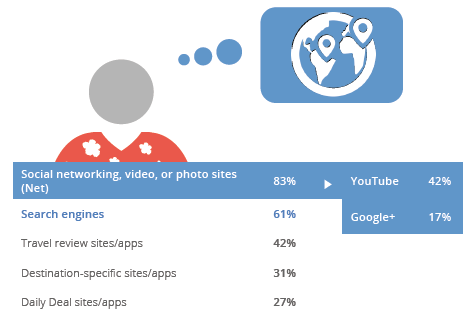 The Reality Check: According to Think With Google: 83% of people turn to social media sites for their travel inspiration while only 31% turn to destination-specific websites. And the gap is growing. The reason for that gap in my humble opinion comes down to one thing: TRUST. Most destination-specific websites are all about broadcasting offers and well-polished pitches about the latest and greatest experiences of their members/partners/stakeholders. They are not about what the best experience is for YOU…which is what you expect the people in your social media network to tell you. And you TRUST them. Destination marketers struggle with the difference between selling and engaging. It’s not that they don’t understand the difference. They have been told that the quickest way to a transaction is to ask for the business. But the world has changed. To quote the Cluetrain Manifesto: “Markets are conversations. Their members communicate in language that is natural, open, honest, direct, funny and often shocking.” DMOs need to join the conversation as an enriching participant rather than as a controlling broadcaster. The best way to do that is to produce relevant and authentic content. What Does That Look Like: Brands everywhere are migrating their marketing strategy toward the generation of “stories” that showcases what their brand values and experiences are all about, engaging targeted users (through social media and live events) to comment, augment and even participate in the story. While some DMOs have succeeded wildly in their content marketing and story-telling (e.g. Tourism Australia’s Best Jobs in the World campaign), most are reluctant to abandon the comfort zone of the broadcast offer mentality. Last week Greg Oates wrote a great piece about how DMOs are beginning to deploy content strategies to engage their meeting planner customers. Marriott has been doing it “brilliantly” for two years. This includes their support of one of the most provocative travel storytelling places I know: Gone on Medium.com. Check it out. Tourism Tofino: I’ve highlited the work of this small DMO before but their commitment to stories and user-generated content as their core marketing strategy is impressive. 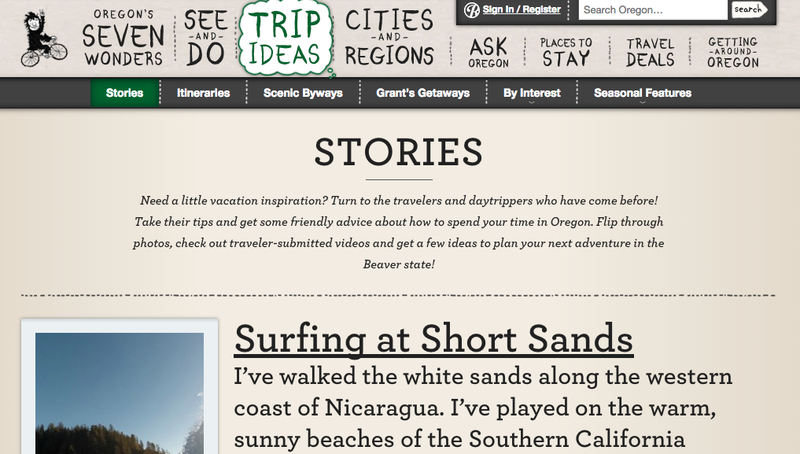 Travel Oregon: Their home page is a collage of user-generated image content linked to Instagram. They also have a library of user-generated narrative stories about Oregon travel experiences…all written by real people just like you. The Hack: One of the easiest and most effective story platforms for a destination is a blog. But I continue to shocked by how few destinations actually have one. Visit CincinnatiUSA has a fine example of using a blog to create stories that engage its customers, specifically meeting planners. And not an offer of dates, rates and space in-sight. DMOs need to make the development of stories that engage their customers as their primary vehicle for creating inspiration and activating conversations about their destination. Its no longer about the offer. Or the product. Its about the story. And the conversation. This Just In: Tourism New South Wales CEO Sandra Chipchase is pushing the DMO content marketing envelope and sees her organization becoming more like a publishing business: “For us, the biggest competition is not between the countries. It’s about information. That’s where the real battleground is. It’s about how to get user-generated content and and get people to follow the aspirational content produced by people and the brand.” (source: SKIFT via @SamShankman). Thanks Padraic! I will definitely check it out. Hope to see you at IMEX.